South Korean President Park Geun-hye, center, pays her tribute during a ceremony to celebrate Korean Liberation Day from Japanese colonial rule in 1945, at Seong Cultural Center in Seoul, South Korea, Monday, Aug. 15, 2016. South Korean President Park Geun-hye defended her decision to deploy the THAAD missile defense system and put new emphasis on North Korean human rights violations during her address to the nation Monday. In her annual speech to mark the 71st anniversary of liberation of the Korean peninsula at the end of World War II, President Park said South Korea will not give in to outside pressure on issues of national security. “We should not think that our destiny will be determined by the dynamic relations of strong powers surrounding us. We must do away with this victim mentality and pessimistic thinking,” she said. Park did not specifically refer to the opposition and veiled threats of economic retaliation from China over the U.S. Terminal High-Altitude Area Defense (THAAD) system South Korea recently agreed to deploy. China and Russia voiced concern that THAAD is intended to build up American power in the region and that its powerful radar system will be used to monitor their military activities in northeast Asia. Nor did she name South Korean opponents living near the proposed THAAD deployment site who argue it will make their region a target for a North Korean missile attack. President Park challenged her critics to come up with a better way to protect the nation against the growing North Korean nuclear and ballistic missile threat. “If there is another way to protect our country and people, the alternative must be presented,” Park said. The South Korean president said North Korea will continue to face economic hardship and international isolation until it agrees to give up its nuclear program. Inter-Korean relations have deteriorated since the North conducted it fourth nuclear test in January followed by another long-range rocket launch in violation of longstanding U.N. resolutions. The U.N. Security Council imposed harsh new economic sanctions on North Korea in March, but Pyongyang has responded with defiance and further missile tests. President Park in her speech, however, added a new emphasis on addressing widespread human rights abuses in North Korea. “We will no longer deny or turn a blind eye to the suffering of the North Korean people who are living in great hardship because of the wrong choices made by the North Korean regime,” she said. In 2014, a U.N. Commission of Inquiry issued a report documenting North Korea’s pervasive and systematic human rights atrocities, including extrajudicial killings, enforced disappearances, arbitrary arrests, beatings, forced starvation, sexual assault, forced labor and torture. 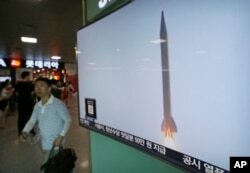 A man passes by a TV news program with file footage of a North Korean rocket launch at the Seoul Railway Station in Seoul, South Korea, Wednesday, Aug. 3, 2016. Many of these abuses, the report noted, are committed in the country's political prison camps where an estimated 80,000 to 120,000 men, women and children are held. The U.N. sanctions do not directly address North Korean human rights abuses, but additional U.S. sanctions imposed in July do target individuals for their role in serious human rights violations, hunting down defectors or censorship in North Korea. In March, South Korea also passed legislation that will make improving human rights conditions across the border part of any humanitarian aid program, and will document rights abuses by the North Korean government and its leaders. Both President Park and Japanese Prime Minister Shinzo Abe took care not to make any inflammatory remarks or gestures that would break the settlement reached last year to resolve their dispute over Tokyo’s’ sexual enslavement of Korean women during World War II. 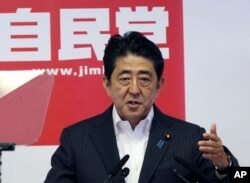 Both sides promised to refrain from publicly criticizing the other after Abe issued an apology statement and Tokyo agreed to contribute more than $8 million (one billion yen) to a South Korean fund to aid the victims. FILE - Japanese Prime Minister and leader of the ruling Liberal Democratic Party, Shinzo Abe, speaks during a press conference in Tokyo. In her speech, Park said the two countries must face history squarely in the face and work together to create a future-oriented relationship. Abe for his part sent an offering to the Yasukuni Shrine, but did not visit the controversial site that honors past war dead, but also includes 14 Japanese leaders convicted as war criminals by an Allied tribunal. Abe has not visited the shrine in person since December 2013 when he said he did so to show respect for those who died for their country.